President Buhari’s full speech at Ebonyi – Royal Times of Nigeria. 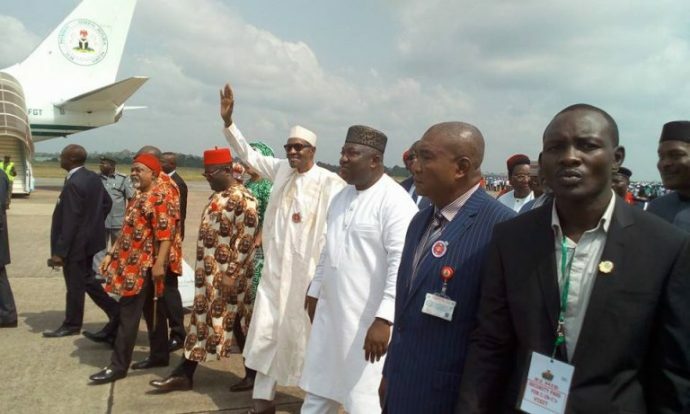 Pesident Muhammadu Buhari arrived Ebonyi on an official visit to the South East, the first of such trip since he assumed office in 2015. Here is his full speech delivered in the state capital, Abakaliki. 2. I want to express my gratitude to Ndi Ebonyi for their hospitality and warm reception since our arrival in Abakiliki a few hours ago. 3. In the last few hours, I have commissioned some landmark projects and laid the foundation stones for the Ebonyi City Mall and a flyover bridge projects. I commend His Excellency, Governor David Umahi for his vision and commitment to the development of his State. 4. In the course of my visit, I also had the honour and privilege of unveiling the statue of a great Nigerian, Sir Akanu Ibiam, whose notable records of humanitarianism, advocacy of free primary education and rural development, will continue to be an inspiration to all. 5. I am also grateful to the people of Ebonyi as well as the South East traditional rulers, who today, bestowed on me traditional titles. To the Ndi Ebonyi, I am ENYIOMA 1 (Good Friend) and to the South East, I am OCHIOHA OF NDIGBO. I thank you for this honour and kind gesture. 6. My presence here today is a demonstration of our strong belief in the unity of Nigeria. As the most populous country in Africa, with over 300 ethnic groups, our diversity is almost unique among nations. 7. The people of the South East are known for their ingenuity, industrial and commercial talent. There is no part of Nigeria where you will not find Igbo entrepreneurs, both men and women, contributing to the development of their adopted communities. 8. So I am asking you all not to buy into the senseless propaganda on secession. Igbo is Nigeria and Nigeria is Igbo. Both are inseparable. 9. We must therefore continue to commit ourselves to the development of Nigeria. A Nigeria where we sustain our national unity without compromising on our cultural identities. A Nigeria where the aspirations of its people is guaranteed without prejudice to tribe or religion. A Nigeria, where we can sleep at night knowing that tomorrow will be better than today. 10. The task of nation building is a continuous one. It never stops. Our founding fathers, from all corners of this country, worked together to actualize the creation of one Nigeria. 11. After independence, the same founding fathers worked together to maintain this one Nigeria. Yes, they had differences and varied opinions at times. After all, they were only human. And yes, they had moments of weaknesses and doubt. But again, no one is perfect. However, one thing they all protected until the end of their lives was having one Nigeria for all Nigerians. 12. Today, Nigeria is 57 years old. Nigeria has gone through many pains. But has also achieved significant successes. Its citizens are leaders in all aspect of human development. But we rarely celebrate these successes more. Some misguided Nigerians would rather channel their energy to propagating negative stories and senseless rumours. 13. Over 60% of Nigeria’s population is under 25 years old. They have little knowledge of Nigeria’s journey. They were not born during the dark days of civil war and the nation rebuilding that happened afterwards. 14. The task of nation building is a continuous one. It relies on the successful transition of factual knowledge from one generation to another. This means it is our collective responsibility to ensure we do not betray our founding fathers as we transfer the Nigeria project from one generation to the next. 16. So parents, speak to your children about the importance of their heritage, culture and being open minded. Teachers, teach your students about the history of this nation and how it was a coalition of diversity that brought it to existence. And leaders, we must lead by example and show tolerance and acceptance of diversity. 17. Today, most grievances expressed by all Nigerians, not only those in the south east, is lack of jobs, poor infrastructure and basic amenities. We are working aggressively to address these. 19. For example, we recently mobilized the contractor of the 2nd Niger Bridge back to site. We have also made provisions in the 2018 budget proposal to ensure this project is completed as early as possible. 20. We are also upgrading the Federal Medical Centre in Umuahia by constructing a Modern Medical Diagnostic Centre. This will further bring quality and affordable health care to the region. 21. In the agricultural sector, the States in this region have participated in all Federal Government agricultural initiatives. For instance, Ebonyi was among the first few State Government’s to sign up to the Presidential Fertilizer Initiative. The program has already created thousands of direct and indirect jobs in this fertile part of the our country. 22. I would like to congratulate Governor Umahi who put aside his political differences to participate in this federally led project that has improved the lives of not only the farmers of Ebonyi State, but the entire South East States. 23. For the South East, I am pleased to inform you that our 2018 budget proposal has allocated up to N10 billion for the development of the Enyimba Industrial Park and Nnewi Auto Park. Both projects will be implemented in collaboration with the respective state Governments and the private sector. Again, these are classic examples of the partnerships between the Federal and State Governments in the region to improve the livelihoods of Nigerians – politics aside. 24. In October 2017, we commenced the payment of pensions to police officers who were granted Presidential pardon in 2000 after serving in the former Biafran Police during the 30 month civil war. These officers, and their next of kin, have waited for their pensions for 17 years since the Presidential pardon. 25. I want to assure the Ndigbo that the welfare and well-being of every Nigerian is important to us. We stand for inclusivity and will not leave any section or citizen behind. 26. I thank you most sincerely for your attention and warm reception. 30. May God bless the Federal Republic of Nigeria.